Seriously. I don’t know what lesson God is trying to teach me. Or should I say the universe is trying to teach me because my God is too loving to knowingly allow me to undergo such trials. When this happened, I mentioned that there was a story for another day. Well, the story was that the painter that Osumi contracted to do up my house decided that he had landed home. How? Work that was supposed to take 1 or 2 days took about a week. Why? I don’t know. He just thought it was cool to work slowly and wait for me to come back home in the evening for us to chat. By the second day, I had caught the drift and gave myself enough stuff to do after work and was getting back home very late. On the fourth day, he painted one wall halfway and left. When I called him to ask what the problem was, he said that he needed to speak with me face to face to explain the problem. I requested him to report to work abit early the next morning and he agreed. Hakuna chai ya asubuhi, was the first question he asked. Huh? Did I invite this guy for breakfast? Ni sawa, pengine kesho utanipikia. Okay, so why did you paint that wall halfway? You couldn’t tell me over the phone that the paint wasn’t enough? Umekua wapi hizo jioni zingine? It is okay, I can buy it and then you can refund me when making the final payment…. But can we leave the house together, you can give me a lift to the shop then you go to work. Anyway, I came back home that night to my bedroom wall painted with a very thin layer of green that wasn’t what I had asked for. But up to date, that is how it still looks like. Why did I not request him to put another layer of paint on it? Because of the text he sent me that night. I also ignored that one. Thank God I now have all his numbers and I don’t pick his phone calls any more. At first I used to get so worried when I saw his phone number because I thought that the loft was on fire or something. So he now washes the car when he wants to and when I feel that the interior should be cleaned, I leave the doors open. My current worry is with the office gardener/driver. He is such a tiny, shy, polite and unassuming person. He is so kind, there was a day I was unwell and he came to pick me up from the hospital. Quite a nice person. The only communication between us has been ‘Please bring my car’ and ‘Your car is here’. Till he started sending me messages intended for someone else. And they were in Luhya to boot! So when it got out of hand, I sent him a message telling him that he was sending messages to the wrong person. And when he responded I was in shock. Masha helped me decipher the messages…. Can you? 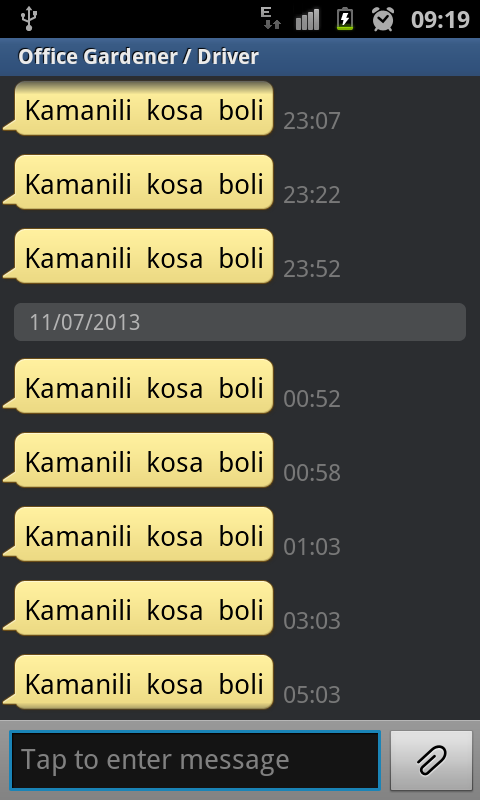 Series of texts sent between 10:57pm and 5:03am!! 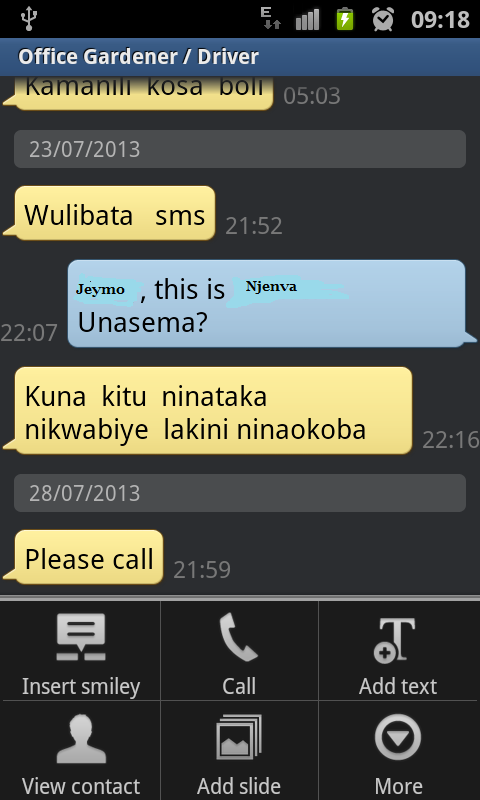 For those who like me thought the texts were in Luhya……. I love you too – I hadn’t mentioned that I loved him so how did that even start. 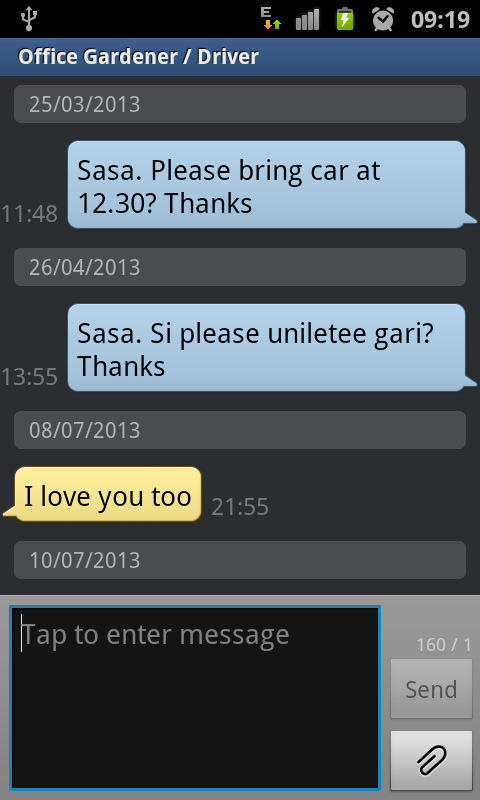 I think he has watched too many movies and he thinks the dude is supposed to say I love you too…. Kamanili kosa boli – Kama nili kosa, pole. If I did something wrong, sorry. So last night he sent a text, ‘Please call’ ….. I am off to deal with that situation right now. Very, tell me about it! Oh gosh, this is hilariously funny but not funny at the same time. So…next thing is Osumi will start sending you such messages? Lol. Maybe you’ve been flirting without realising that you’re flirting? I don’t even know how to flirt. And everyone says that I have the most scary screen saver face ever so there is no way I was giving ‘come hither’ looks without knowing. And you should see all their sizes…… tiny little things yaani…. LOL! Tiny little things! But seriously this is depressing! Gives me a headache just reading it! Aki it is not funny. What is happening here? Dead! You really have made my slow traffic jammed trip bearable. What! I loved you from the first saw? If that aint legendary……. That was the one that looked like Adrian!!! J, enyewe hata pia mimi washa ni confess! This ain’t funny by the way!!!! Whuat!!!! Extremely hilarious but not funny at all!! Im in the same predicament since I moved to the village 🙂 you however have no excuse! Steps away from monitor….I need space to laugh….this is so funny its illegal….this happens to my big sister ALL THE TIME….its either the mahindi guy or the kiosk guy or the newspaper vendor…too funny!!! 🙂 Thanks for reading! Maybe you penned something so that I can request you to let your big sister know that she is not alone. Please request her to read the blog and we can share notes…..Maybe we have the same hairstyle! This made my day …clearly you are an amazing woman who is attracting the wrong caliber of men. Hahahahahahha laughing with you not at you.